Click here and then type in your email and password. Your default password is cohley123. You can change your password after you login! Click here or click on the drop down menu in the upper right hand corner and select "Change Password." Click on the “Home” header and select “Edit Profile” button. What does it mean to click "save", "no" or "interested" on a Brand? Interested sends them an email notifying that you are interested/would like to work with them. Save puts them in the “Saved” drop-down and stores them for later. No puts them in the “No” drop-down. What is the Medals program? The Medals Program on Cohley is a way in which Cohley's most active creators can be rewarded and brands can view your medal level. Your medal level is displayed right next to your name in the header. Click here to learn more about the program and how to improve your medal level. How do I directly chat with a brand? Go to the “Discover” tab and click “Interested”, then “Interested in me”; all of the brands listed have expressed a desire to work with you. You can also initiate a relationship by going to the "Discover" tab and clicking on "Interested" under the thumbnail of brands that you hope to work with. The brand will get a notification that you are interested and decide whether they’re also interested in working with you. If they are, they will show up in the “Interested in me” tab where either the brand or you can initiate a chat. Where do I find campaigns open for applications? Go to the “Campaigns” tab and then click on “All Campaigns”. How will I know if a brand campaign is a good fit for me? Click on the campaign's thumbnail and PLEASE make sure to read the "Creative Brief" section. This is the area where many brands express their desires for the potential partnership and describe further details about the campaign. When you find an active campaign that you would like to apply to, either click "Apply" on the bottom of the campaign's thumbnail or when in the detailed campaign page, click "Apply" at the upper right hand corner. Simply follow the steps in the pop-up window and then click Submit to complete your application. Make sure to read over the campaign details for special steps the brand may want you to include in your application (i.e. product selection or listing qualifications). NOTE: once you have submitted your application, it is final and cannot be edited! Each campaign has specific compensation levels set by the brand. You can find this by either looking in the "Compensation" section of the campaign's thumbnail or by clicking on the campaign and looking under the "Compensation" section. Additional information may be found in the creative brief. How do I clear my campaign notifications? To get rid of any chat notifications that may still be lingering in a campaign, simply click into the chat box. If it's a notification to complete a certain task, such as submit content, the notification will go away when you complete that action. How do I send content for review? Go the campaigns tab and select the specific campaign that you would like to submit content to. Then, scroll down to the chat in the selected campaign and under your profile click "Send Content for Approval". Then simply upload your content and submit. How do I send my post link? You can send the link to your post by clicking to the "Campaigns" tab and selecting the campaign you need to add the link to and then clicking "Add Link to Your Post" located under your profile. Simply paste the URL and then select upload and you will get a confirmation email confirming that you have completed the campaign. How will I be notified if a brand accepts my application? You will receive an email from Cohley notifying you which campaign you are accepted into. You can also check on Cohley by clicking to the "Campaigns" tab, and in the Active Campaigns it will show the status of the campaign as "Accepted" on the thumbnail. You will not receive a notification if you are not accepted to a campaign. How will I be notified when I complete a campaign? You will get email confirming that you have completed the campaign. 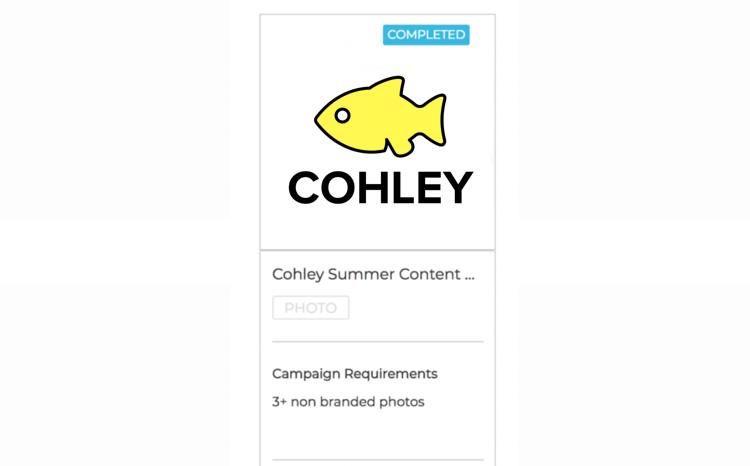 You can also check on Cohley by going to the "Campaigns" tab, and in Active campaigns it will show the status of the campaign as "Completed" on the thumbnail. How will I get paid for my work if I’ve completed a paid campaign? Brands pay you directly using Stripe and Cohley does not take any cut of your compensation. Click on the "Home" tab and click the button "Create Stripe Account" and fill out all the required sections. If you already have an account click “Create Stripe Account” and click "Sign In" at the top right corner to login. How do I know when a brand has paid me? You will get a notification and email once a brand has paid you. In addition, in the chat located in the specific campaign, there will be the specific time stamp when the brand paid you. Have any further questions? Fill out this form and we will get back to you shortly!